ESF will be decking the halls of the Everson Museum in December. 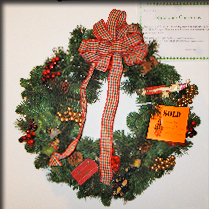 The College has donated a decorated wreath to the annual Festival of Trees. The ESF wreath, “Adirondack Christmas,” celebrates the holiday season as experienced from the College’s nearly 20,000 acres of teaching, research and demonstration properties within the Adirondacks. The wreath is adorned with ornaments featuring native Adirondack animals — moose, bear, and birds – whimsically enjoying environmentally friendly recreational activities such as skiing, fishing, and sledding. ESF operates The Ranger School in Wanakena, where students study forest technology and land surveying technology; the Adirondack Ecological Center in Newcomb, where researchers provide the science that underpins the management of the park; and Pack Demonstration Forest in Warrensburg, which hosts environmental education camps run by the state Department of Environmental Conservation. The Festival of Trees runs 10 a.m. to 5 p.m. Nov. 30 through December 9.